The Brain Pro (NOVA Series) from 3D4Medical is a remarkable app that will certainly come in handy for students of anatomy or even anybody with an interest in what things look like inside their noggin. That’s not to say that this app is designed for the layman. However, neither is it so obtuse that someone who’s curious about anatomy can’t get some value out of it. Perhaps that’s the biggest strength of The Brain Pro (NOVA Series); that it can appeal to serious students and common folk alike. 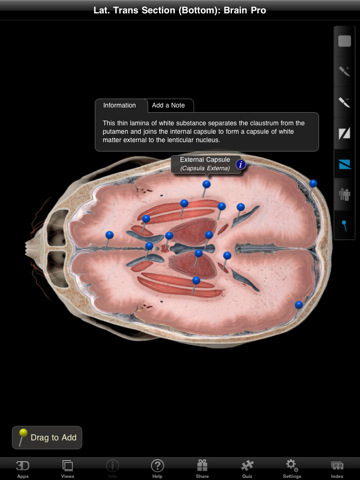 And while not every aspect of the app is perfect, The Brain Pro is an invaluable tool and a wonder to experience. I should preface the following by making it clear that I am not by any means an expert in anatomy. My interest in The Brain Pro comes from simple curiosity, and for me, Hippocampus and Cerebral Cortex are just terms that are fun to say. The app begins with a nice tutorial, giving users a walkthrough on how to get the most out of the app. 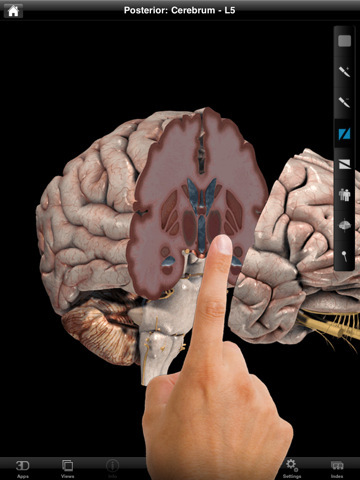 You’ll be able to look at the brain from different layers by clicking the “slice” button. You can also use your finger to cut the brain into sections, providing an inside look at each of its parts. By using your finger, you’ll also manipulate the angle of your view. In addition, if you’re looking for a specific piece of the brain, you can click on a list and you’ll be led directly to that point of interest, marked by a pin. And if you’d like, you’re also able to create custom pins and attach notes to them for future reference. Though I’m no expert in the field of anatomy, I do have a couple issues with The Brain Pro. First, manipulating the brain can be a bit touchy, and sometimes simply tapping the brain will send it spinning around until you tap it again to stop it. 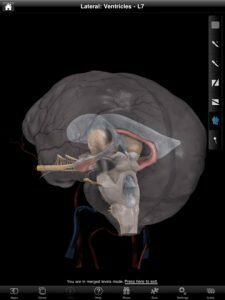 Furthermore, while the ability to look inside the brain is certainly interesting, the view options are strictly limited and users are only given a few sections to examine. This gives the app less of a “virtual brain” feel, and operate more like one of those plastic brains we all enjoyed taking apart in high school science class. Bottom Line: While The Brain Pro offers a lot of great information, the price tag will turn away many. 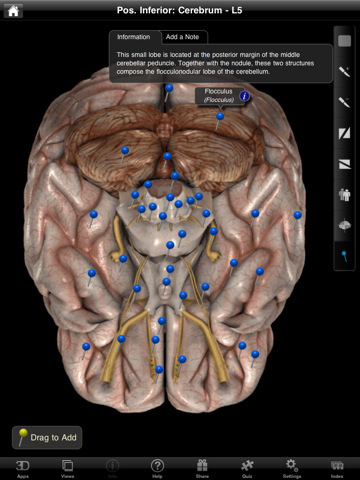 The Brain Pro is compatible with iPad. Requires iOS 4.2 or later.